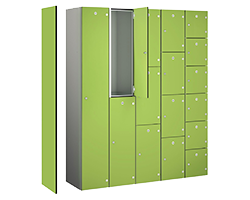 At CS Storage, we have a fantastic range of locker accessories in the UK to enhance and help manage your facilities. Whether you’re looking for replacement locker numbers or integral seats and stands, we have all the locker accessories to fit your products. After you have made an initial purchase or you would like to change something with your existing locker, there are a range of UK locker accessories we can supply at the point of order. If you have a key management system or lockers that need keys returning to a specific locker such as changing room lockers, locker numbers are the perfect solution. They are available with or without numbered key fobs so that you can make sure you track your keys. However, it’s inevitable that from time to time keys will still go missing, but don’t panic! See our replacement key service for more details. When purchasing locker accessories in the UK, make sure to buy locker stands. They are an ideal choice to help clean underneath lockers and if you have wet area lockers, raising them off the ground is a lot easier. If you need locker accessories for a changing room, our integral seat stands are a perfect saving option. Rather than having a separate bench in the centre of the room, the seat stands are attached to the lockers and available in 5 different widths with adjustable feet to give stable base. Occasionally when larger less valuable items or clothing don’t need to be locked away, garment hanging units can be used to hang uniforms and clothing which gives you more space within the locker. CS Storage strives to provide their customers and clients with outstanding lockers and storage solutions. With one of the top locker accessories in the UK, we can provide you with the best solution at an affordable price. Take a look at our categories below or call us on 01772 332634 to speak to one of our team members.